Terrible Portraits are sub bosses in the game Wario World for the GameCube. There are two Terrible Portraits Wario must fight in Mirror Mansion; one in the middle of the level and one at the very end of it. They appear as three photo frames, one on the left, one on the right and a large one in the middle. 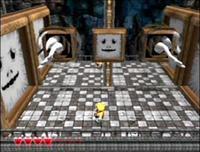 The side frames have two white arms coming out of them and the large middle one has a face resembling a carved jack-o-lantern. To attack, the arms will summon different elements to attack Wario. The Terrible Portrait's first attack involves summoning a large fireball that homes in on Wario. The second attack is similar, only with electricity instead of fire. The electricity will only travel in a straight line; however, it is much faster than the fire. Its third attack is a large boulder that slams down on the ground below it, crushing Wario if he happens to be standing there. Its final attack is to summon a giant ice ball. If Wario is hit by this, he will not get damaged, but he will be frozen and susceptible to follow-up attacks. Players must wiggle the Control Stick to free themselves. The main Portrait will create Barrel Busters. Wario must stun these, and piledrive them while standing under one of the arms to do damage, as the picture gets out of range when Wario gets near. This is similar to Wario's fight with the Angler Mangler. It is possible to skip both Terrible Portrait fights in all non-Japanese versions of the game, the first with a glitch known as a Super Jump and the second by jumping around either border, although it locks the camera to a specific angle for both. ↑ Stratton, Steve. Wario World Prima Official Strategy Guide. Page 92. This page was last edited on January 14, 2019, at 23:22.